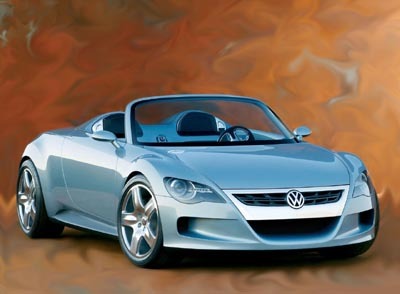 The Volkswagen Concept R roadster was a 2003 concept which was shown at the Frankfurt Motorshow in Germany. 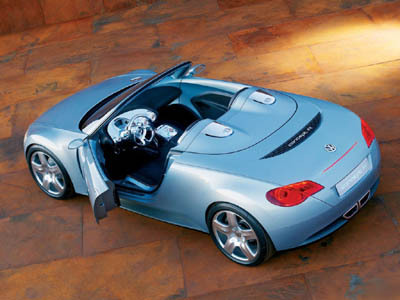 The Concept R was powered by a mid-mounted V6 mated to a six speed automatic gearbox. Exterior styling of the Concept R is dominated at the front by the multiple grilles feeding air back to the engine. Behind the cockpit two racing humps flow into the bodywork giving the R a more sporting appearance. 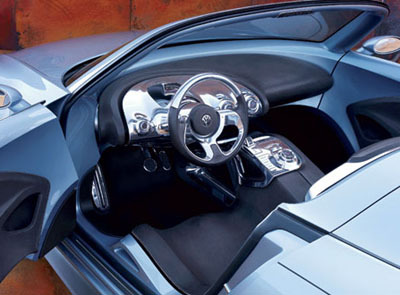 The interior of the Concept R is highlighted by an organically shaped chrome console and instrument cluster. The seats of the Concept R are not adjustable themselves, instead the instrument cluster, steering wheel and pedals adjust electronically. For the passenger an electronically adjusted footwell support is provided.